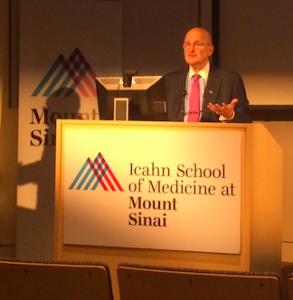 New York, NY (January 10, 2016) – On Friday, January 8, 2016, the Mount Sinai Department of Family Medicine and Community Health hosted Stephen Berger, currently chairman of the private investment firm Odyssey Investment Partners, who spoke at the Department’s Grand Rounds. Berger, who headed up the Commission on Health Care Facilities in the 21st Century which later became known at the Berger Commission, was charged with making recommendations for the restructuring of the health care system in New York City. Berger spoke from a historical perspective about how the health care system evolved into being so hospital centric and said that changing the health care system was a profoundly difficult endeavor. One of the profound features of our system, he explained, started in 1965 with the advent of Article 28 – and the certificate of need process, which, in order to be passed, included provisions restricting publicly owned acute care hospitals in New York. This, in turn, led to a less efficient, less competitive health care system in New York. All of this was done on a strictly fee-for-service reimbursement system leading to a system driven by sickness and not by keeping people healthy. He also described the importance of healthcare as a driver of employment and the importance of the health care workforce in sustaining our system the way it is now. Workforce issues came to dominate over those forces which were trying to reduce health care costs. Hospitals and the clinics and emergency rooms they ran, became the community-facing part of the healthcare system. All of this needs to change, Berger said, as healthcare moves out into the community stressing primary care and disease prevention. The change in financing to a value based system will facilitate this and will be supported by the DSRIP program and other innovations being driven by CMS, the State, as well as by private payers.